Paul and Bridget live and work at Emmanuel Community Development Center, the base of operations for our mission. Paul maintains the facilities, does the landscaping, and cares for the farm. We both act as hosts for visitors. Bridget teaches English Classes for adults and children in the surrounding communities. 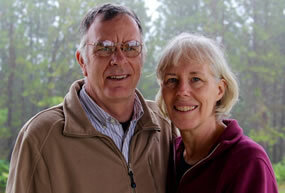 How did a couple from Oregon land in the mountains of Costa Rica? Since before we were married, we each wanted to serve overseas on the mission field. I (Bridget) was studying education when I met Paul at college in Oregon. After we married Paul learned to fly helicopters in the army and we made some special friendships with missionaries while Paul was stationed in Panama. Paul finished his six-year commitment to the army and then worked in different businesses in the civilian world. I homeschooled our three children and when they all graduated and left home, Paul closed his landscaping business, we got rid of most of our possessions, and Paul found a flight school to bring his helicopter license current. We were ready for a change. The Lord gave us an opportunity to join Helimission, a group based in Switzerland that uses helicopters to support missionaries. They recommended we go to a cross-cultural training course at a bible school in New York for a semester. It is while we were there that Paul was put in touch with Dr. Alekcey Murillo. He and his wife, Judith Dunteman, are both doctors with Indigenous Community Development International (ICDI) and work in an isolated, mountainous region of Costa Rica. They are involved with different community development projects (health, education, economic, infrastructure, etc.) in order to meet the needs of people and share the love of Christ with them. This type of mission fit with what we desired to do. So when Alekcey invited Paul to be involved with starting a helicopter flight program in Costa Rica, we moved to San Jose in 2012 to help with this project and study Spanish. Aero Vital, the name of the flight service, has been approved by the Costa Rican government and is currently operational. In 2015 we were formally accepted as ICDI missionaries and have committed to serving here in Costa Rica long term, with the understanding that we will continue to raise funds to cover our expenses. Since coming to Costa Rica Paul has had some health problems that prevent him from flying, so Alekcey asked Paul to manage ICDI’s base of operations in the mountains. Paul has experience maintaining facilities and landscaping, and moving to Emmanuel Community Development Center has been a good fit for him. I have been using my education background to teach English classes. No two days are alike at Emmanuel Center, but in our regular duties we look for opportunities to love and serve the people here and to help the other missionaries with their Community Development Projects. Visit our blog and read what God is doing in our lives and in Costa Rica. Donate to our support and funds will be used for our ministry and personal expenses. Thanks for your interest in our ministry in Costa Rica!